tecting groups at C2) and "disarmed" (ester protecting groups at C2) ra-pentenyl glycosylation strategy introduced by Madsen and Fraser-Reid  has proven to be a powerful tool for complex oligosaccharide syntheses that also is applicable to thioglycosides and few other glycosyl donors (reviewed in Ref. 42). Despite the versatility of this approach, there remains opportunity to further fine-tune the leaving ability of the glycosyl donor and thus to realize a greater potential for oligosaccharide syntheses. 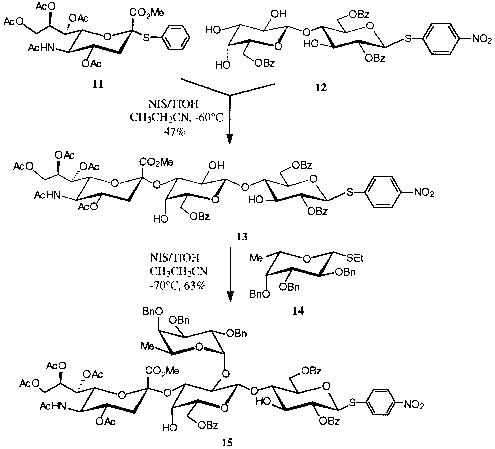 Another versatile strategy, coined the "active-latent'' glycosylation strategy, in which the reactivity of the carbohydrate units can be directly controlled by the agly-cone, together with the differential protection of the glycone itself, enabled the synthesis of various oligosaccharide donors [34,43-47]. Two realizations were found to be analogous: that the nature of the substituents on the aryl thioglycosides could be used to modulate the nucleophilicity of the an-omeric sulfur atom and that protecting groups that could be used as "armed'' or "disarmed" glycosyl donors. Thus an electron-donating group (EDG: e.g., Me, OMe, NHAc, H) placed in the para position of the aryl moiety of an aryl thioglycoside provided ''active'' or "armed" glycosyl donors, while electron-withdrawing groups (EWG: e.g., NO2, Br, Cl) afforded ''latent'' or "disarmed" thioglycosyl donors that could be used as building blocks in blockwise oligosaccharide syntheses. ''Latent'' thioglycosyl derivatives, possessing one free hydroxyl group and corresponding to ''temporary inactive'' species, serves as glycosyl acceptors. Their reactivities can be ''turned on'' by transforming their electron-withdrawing thioaryl substituents (e.g., NO2) into electron-donating groups (e.g., NHAc), thus ''reactivating'' the sulfur atoms toward electrophilic promoters usually employed in glycosylation reactions. Alternatively, the ''active'' thioglycosyl donors should already possess EDG substituents on their aryl moieties. The ''latent'' thioglycosyl acceptors can be glycosylated with ''active'' thioglycosyl donors by using thiophilic promoters. The disaccharide can then be transformed into an ''active'' glycosyl donor by modification of the aryl substituents. Taking advantage of both ''active-latent'' and ''armed-disarmed'' concepts, it was possible to modulate the reactivities of thioglycosyl donors and acceptors by changing both the nature of the substituents in the para position of the aglycone's thiophenyl group and the protecting groups at the C2 position [34,43-46]. This has expanded the reactivity differences between thioglycosyl donors and acceptors and thus provided improved flexibility for the proper choice of glycosyl donors and acceptors toward building complex sialylated oligosaccharides. Initially, the method was based on the differential reactivity conferred on each of the partners by the nature of the protecting groups and by the intrinsic nucleo-philicity of the thioaryl leaving groups. However, as the method evolved, it became clear that the choice of the promoter was also an important factor to take into consideration. Indeed, it was demonstrated that a ''disarmed'' thioglycoside could be activated in the presence of powerful thiophilic promoters such as V-iodosuccinim-ide/trifluoromethanesulfonic acid (NIS/TfOH), whereas it remained inactivated in the presence of weak thiophilic reagent such as iodonium dicollidine perchlorate or methyl triflate [43,45]. presence of latent 4-nitrophenyl thiolactoside 12 to provide sialyllactose derivative 13 in 47% yield. Then armed-active perbenzylated ethyl thiofucoside 14 was used to further regioselectively glycosylate trisaccharide 13 at O2' of the galactose residue to give sialylated tetrasaccharide 15 in 63% yield (46). 4-Nitrophenyl sialyl-1-thio-lactoside 13 still possesses an aglycone that can be further transformed into an active glycosyl donor (NO2 ^ NH2 ^ NHAc) or into a reactive acrylamido monomer (NH—COCH=CH2) for copolymerization purpose .